Calm and cold weather at the moment. Minus 3,5 degrees in the morning. Kept around half the nets open 09-14, netmeter hours approx. 1000. Apples on the lawn and feeder with seed mix. Despite temperatures well into the blue there were still Song Thrush, Blackcap and Chiffchaffs in the catch. 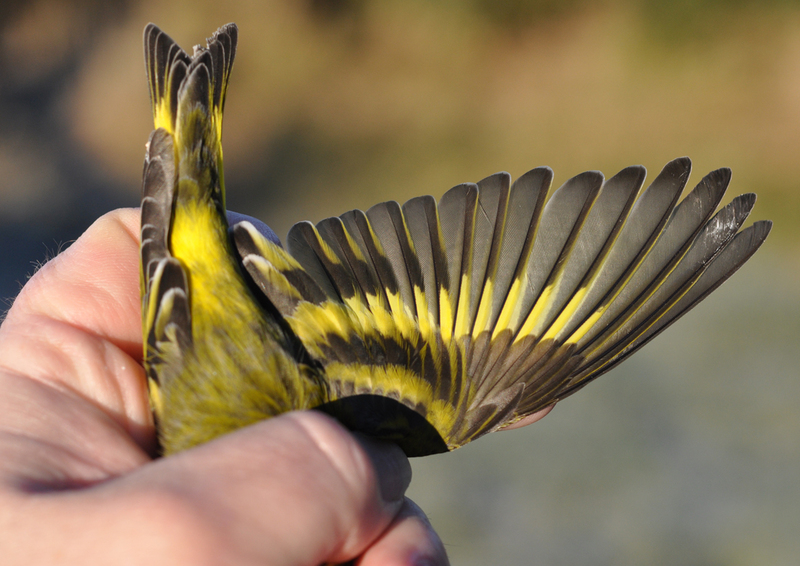 Eurasian Siskin 2cy+ male. Grønnsisik, 2K+ hann. Ringed: Fieldfare 7, Common Blackbird 4, Song Thrush 1, Blackcap 1, Chiffchaff 2 (abietinus), Goldcrest 1, Tree Sparrow 4, Chaffinch 2, Greenfinch 1, Eurasian Siskin 7, Yellowhammer 3. Total = 33. Also 6 controls. 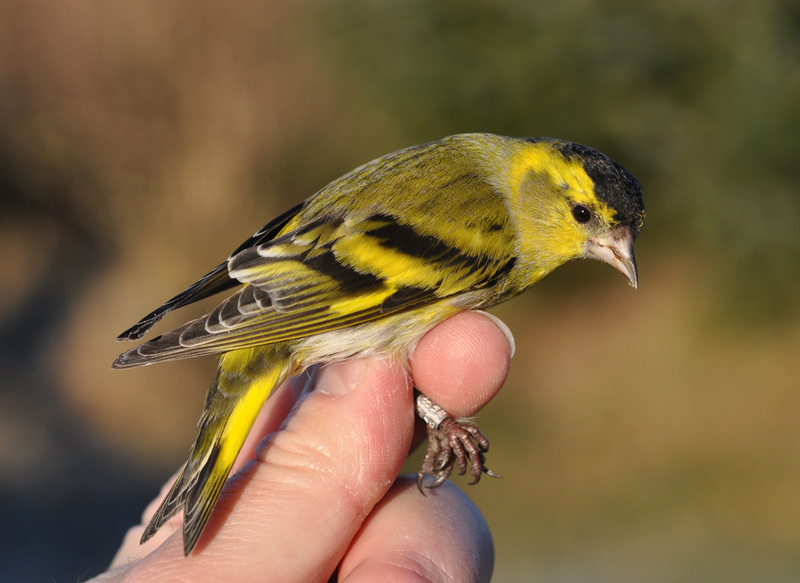 7 Eurasian Siskins were trapped and ringed today, all were males, 6 were 1cy. This species is quite easy to age. 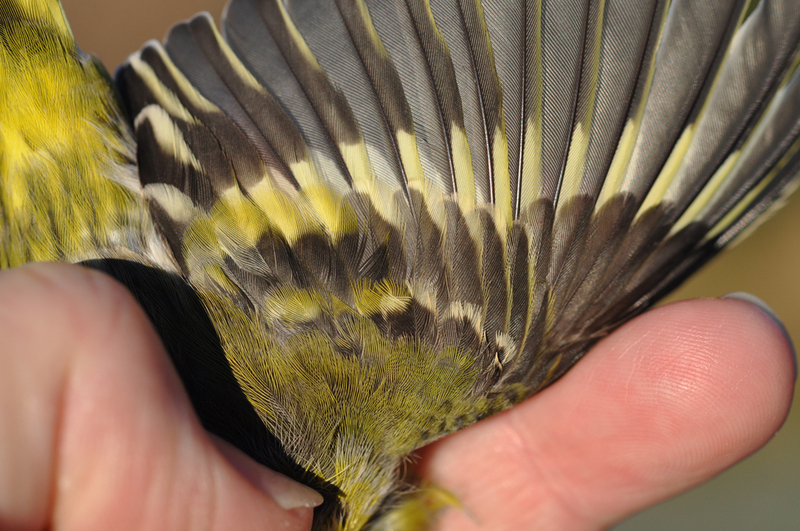 Adults (top) have rounded and quite fresh tailfeathers, and all greater coverts are of adult type, black with greenish edges. 1 cy have more pointed and worn tailfeathers, and usually an obvious contrast in the row of greater coverts (lower). This one has 4 inner gc of adult type and 5 outer are paler brown juvenile feathers. Ringmerket: Gråtrost 7, svarttrost 4, måltrost 1, munk 1, gransanger 2 (abietinus), fuglekonge 1, pilfink 4, bokfink 2, grønnfink 1, grønnsisik 7, gulspurv 3. Total = 33. Også 6 kontroller.